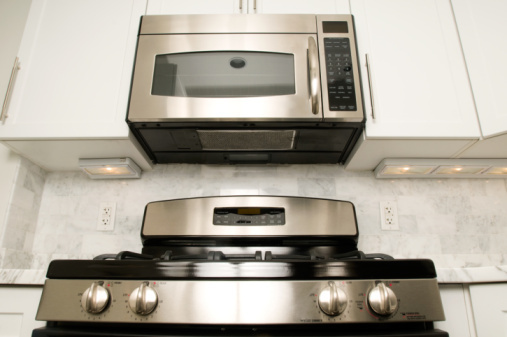 Stoves with glass cook tops are popular accents in homes with high-end appliances. These cook tops are highly efficient and simple to clean. However, they are also fragile and easy to break. When a glass cook top breaks, it can be replaced so that the stove can be utilized. Unplug your stove as a safety precaution. Unscrew your cook top from the stove. There are typically four screws, one in each corner. Prop up the frame and disconnect the wires that are leading to the cook top. Be very careful not to shatter the glass by applying too much pressure as you unscrew. Gently pull the cook top out of the frame. Watch for sharp edges as you remove it. Wrap the old glass into an old towel and gently tap with a mallet to break it up for disposal. Slide the new glass cook top into the frame. Reconnect wires to the cook top. Screw the four corners back down to hold the glass into place. Wipe your cook top with a damp cloth or rag. Melanie Fleury has been writing professionally since 1995. She has written for various educational websites such as Edhelper.com and is the educational consultant at the Knowledge Tree Center for Education. She enjoys creating curriculum for children with various learning styles. Fleury holds a master's degree in education specializing in early childhood from Ashwood University. How Do I Replace Glass on a Microwave Door?